Place shrimp and chicken in a food processor fitted with the “S” blade and pulse until coarsely chopped. Scrape the mixture out into a large bowl and stir in garlic, green onions, fish sauce, black pepper and sugar. Add crab and form into 36 balls. Bring broth, soy sauce, brown sugar, chili sauce, lime juice and ginger to a boil in a Dutch oven over medium-high heat. Drop in the meatballs and cook for 10 minutes. 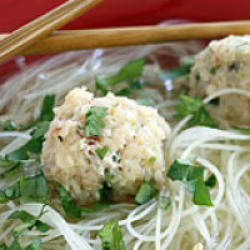 Divide the noodles among 6-8 soup bowls and top with the meatballs. Ladle the broth over the soup and serve with a sprinkling of the chopped cilantro.